Senator Cory Booker officially announced his candidacy for president on Feb. 1. Booker reportedly made around $1.3 million in speaking fees from 2009 to 2012. In 2013, Booker came under scrutiny for failing to report his stake in the video-sharing site he co-founded, Waywire. One offshoot of the Brett Kavanaugh hearings for his Supreme Court nomination was an increased level of exposure for the members of the Senate Judiciary Committee, including several names that are being discussed as potential Democratic challengers for the presidency in 2020. One of those names was Cory Booker, a New Jersey senator who officially announced his candidacy for president on Feb. 1. But what has Booker’s rise to political prominence meant for his finances? Here’s a closer look at Cory Booker’s net worth as he begins the run for the highest office in the land. As of his most recent financial disclosure, Cory Booker reported assets that would put his net worth between around $600,000 and $1.3 million. Among the sources of his wealth as of the last disclosure are a Bank of America savings account with $100,001 to up to $250,000 in it, a Fidelity Money Market account worth between $250,001 and $500,000, and two Fidelity IRAs worth a combined $150,002 to $350,000. Booker released 15 years of tax returns in 2013 during his first run for the Senate, which revealed some $4 million in income over that period with $1 million paid in taxes. That income included earning $1.3 million in speaking fees — mostly from 2009 to 2012, at which time he was the mayor of Newark — and a $690,000 payout from his former law firm. Booker also came under some scrutiny in 2013 for failing to disclose his stake in video-sharing site Waywire, which he co-founded with Google executive chairman Eric Schmidt. Booker’s stake was worth an estimated $1 million to $5 million as of 2013, but he announced in September of that year that he was leaving the board and donating his shares to charity. The site was acquired by Magnify in October 2013 for an undisclosed sum. 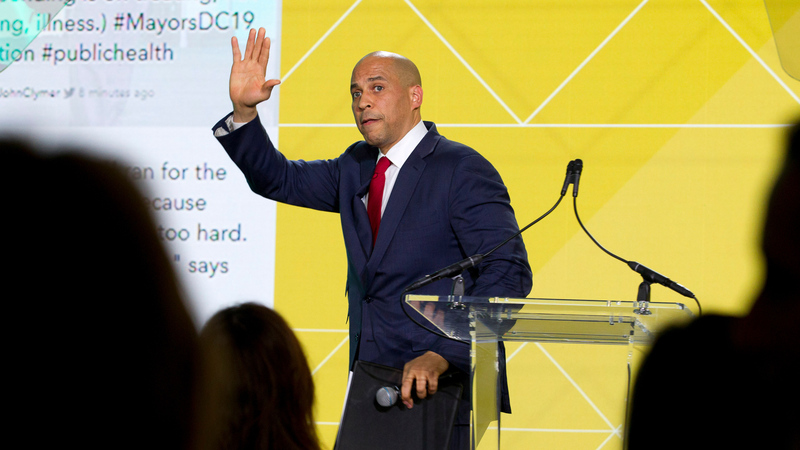 After growing up in Harrington Park, N.J., Booker attended Stanford — where he played on the varsity football team — before becoming a Rhodes Scholar and receiving an honors degree in history from Oxford University. After attending law school at Yale, Booker eventually found his way to politics at the age of 29 when he was elected to the Newark City Council. He was elected mayor of Newark in 2006 and then elected to the U.S. Senate via a special election in October 2013. He won a full term the following year. Read more about how much President Donald Trump’s staff makes. Figures are accurate as of Oct. 3, 2018.